It is easy to tell whenever there is a new Toca Boca app released, as the excitement in our house is almost palpable, with both myself, and my 6 and 3.5 year-old girls equally as enthusiastic. First there is the build up as we try to guess what the game play will be like and what new characters we’ll see. Then there is the all-important Toca Boca splash screen…what will that smile morph into this time? Finally, it’s onto the app. Toca Boca’s latest, Toca Builders is a sort of construction / coloring game set in an open sandbox environment to let your kids use their imaginations to build, destroy, color and explore. The developers have said the app draws inspiration from Lego and Etch A Sketch and that is a rather apt description. 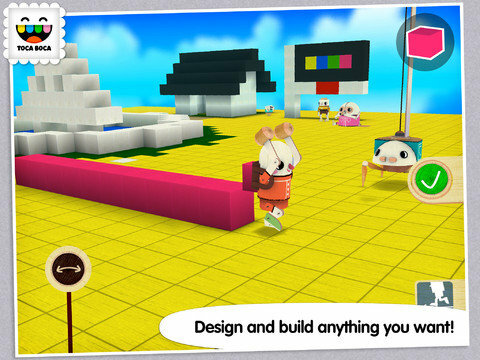 Toca Builders is more in the vein of Toca Boca’s other open-ended titles like Toca Hair Salon and Toca Train, where there aren’t any specific tasks that need to be accomplished, it’s more of a “here is this world we’ve created, now go and play and have some fun” mentality. While this less structured style certainly does not work for all children, my girls thrive in this type of environment and letting their imaginations run wild often leads to some pretty cute and creative and funny ideas. 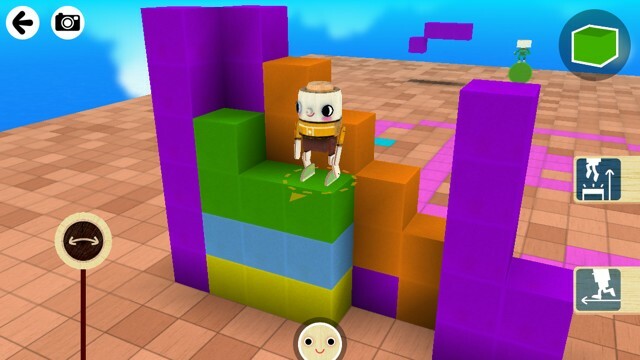 The child gets to take control of the game’s six adorable mechanical robot-like creatures, placing cube-shaped blocks anywhere on the large parquet floor-like gridded island the Toca Builders inhabit to build shapes, patterns and structures. Cubes can be stacked, laid out in a line, repainted, destroyed or even placed floating in mid-air depending on your builder of choice. Each character has unique abilities, allowing your child to interact with the environment is a number of different ways. First there is Blox who drop blocks behind him from his backpack as he runs or smash ones in front of him if necessary. Cooper loves to paint the ground, while he rolls around on a huge ball. Vex is a great stacker and blocks mysteriously appear from beneath him. 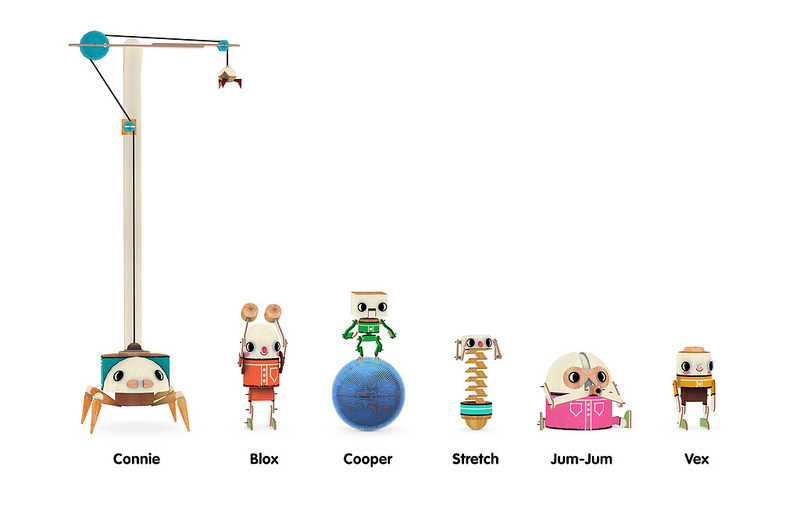 Stretch has a telescoping body allowing him to place blocks on the ground, up in the air or anywhere in between. Crane-like Connie can lift blocks and move them wherever you’d like and finally there is the another artist in the group, Jum-Jum who will spit paint where ever you direct him to. The characters are absolutely adorable and there are some nice little graphical details and touches. For instance, when you turn off Blox’s ability to drop cubes, you can see his backpack close and you can see the paint splatter and soak into the ground as Cooper and Jum-Jum paint. Along with their varying abilities, each of the builders have their own unique set of simple controls. 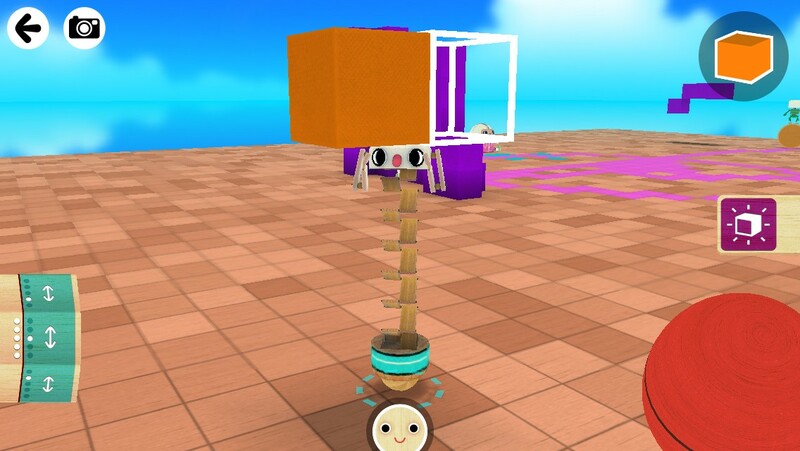 For instance, Blox has a button which moves him forward as well as a separate switch that enables and disables his ability to create blocks, and finally a lever that rotates him so he can move in another direction. However, by far the greatest single control in the game is the virtual trackball employed for movement by Cooper, Connie, Jum-Jum and Stretch. It works so well and behaves just like a traditional trackball with a slow loss of momentum when swiped vigorously. I’ts a shame this is a control type that much of the core audience will have probably never actually experienced in its physical form, and probably wont appreciate how amazing of a job Toca Boca has done with this single detail alone. After a short pseudo tutorial where you are limited to just Vex, all of the characters become unlocked allowing you to switch and experiments at will. So I could get familiar with the interface and not steal the game away from Emily (age 6) I had the game up on mu iPad while she was playing on the family iPad. When I saw the controls and the panning camera view my immediate thought was “oh no”, this is going to be the first time she was going to really struggle Toca Boca game. Hands down, Emily’s favorite builder is Stretch. She giggles as Stretch goes up and down and marvels at his ability to place blocks in the middle of the air. Emily loves to narrate what’s happening while she’s playing, instilling each of the builders with their own personalities. One thing that she really enjoys is using Vex to build staircase structures and then take him for a ride up and down and then on the walls built by the other characters. She likes to try to pick up the other characters with Connie’s crane (though this doesn’t appear to be possible, that certainly doesn’t stop her from trying or just pretending that she actually has). You can have multiple projects going on at the same time, so if you have little ones sharing the same device, they wont mess with each other’s job sites. Emily’s younger sister Claire (aged 3.5) had a little bit tougher of a time picking up the controls and is having a lot of fun with the game as well, especially the trackball and Jim-Jim the amazing spitting painter. Unfortunately Vex seems to be the only builder who can actually climb up onto a block. It would be nice if the other characters could do this as well. One other slight adjustment I would suggest is with regards to the color selection dialog box. When you want to change the color of the blocks / paint a builder is using, you first tap on the ‘color’ button which brings up the dialog, then tap on the specific color you want, then you have to manually close the color dialog box. It would be nice if this last step was eliminated and when you select a color the dialog box is closed automatically. It just seems like an extra, unnecessary and confusing step. 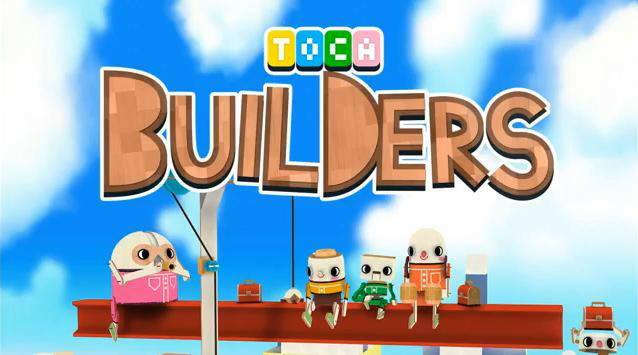 Toca Builders is a another fun Toca tool for your little builders and artists to use their imagination. 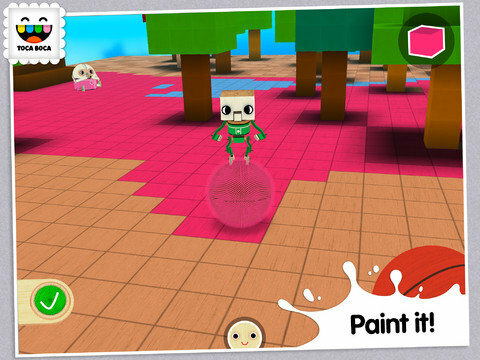 The unique abilities of each of the game’s cute cast of characters encourages exploration, experimentation and free play. While I would love to see the game expanded to include more characters that can interact with the environment (not just build it), even as it stands right now, Toca Builders‘ 99¢ price tag is a great bargain for this toy which will easily offer your child hours upon hours of entertainment and giggles.